"Good value for the area. The hotel was quiet and clean. The bed was a little soft. The staff was helpful and courteous.2018-08-12"
"We've stayed at this hotel since 2008. The rates are reasonable, the rooms are always neat, and the staff is always friendly.2016-09-19"
"The hotel had an awesome breakfast.2015-11-11"
"Clean hotel. The staff was friendly and welcoming. Great place to stay.2015-09-29"
"Nice hotel room with an awesome bed. But the pool area needed cleaning, and it looked like construction work needed to be completed. 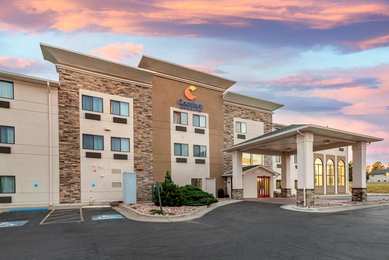 Not a high-end place, but it sufficed for a night.2015-07-21"
Learn more about Pueblo Hotels & Motels in our Pueblo Hotels Guide.